A look at the flora and fauna of South America.with Dr Kevin Elsby. Last of the monthly print and DPI competitions with Judge Dave Stewart. Talk on Prints from out of the Box. It is a mixture of colour and monochrome prints, of nature, creative, patterns, still life and landscapes by Kevin & Margery Maskall. Ian will guide us to what’s coming up in the new summer programme. 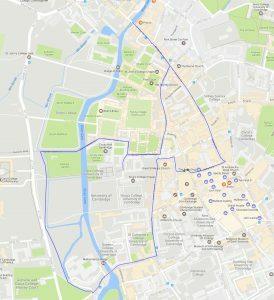 Dates, venues and suggestions of the type of lens needed for each trip. Annual DPI Competition with Judge Ken Payne. Annual Print Competition with Judge David Steel. Our AGM. Sure to be interesting and possibly controversial. End of year relaxation at the Dolphin Hotel for the Annual Dinner and awarding of trophies to the winning images from the various competitions throughout the year. Cost will be £65/number attending - usually 12 people. This 2nd trip will only run if there are sufficient numbers. You'll be notified if that is an option. Final costs will be determined by number shooting. The event is free but I need to know numbers to print off sufficient challenge sheets. A second 2 hour cruise along the River Great Ouse. Leaving from the Quay St Ives. 12 maximum seats - £65 per hour cost shared. First come first served! Early booking recommended. 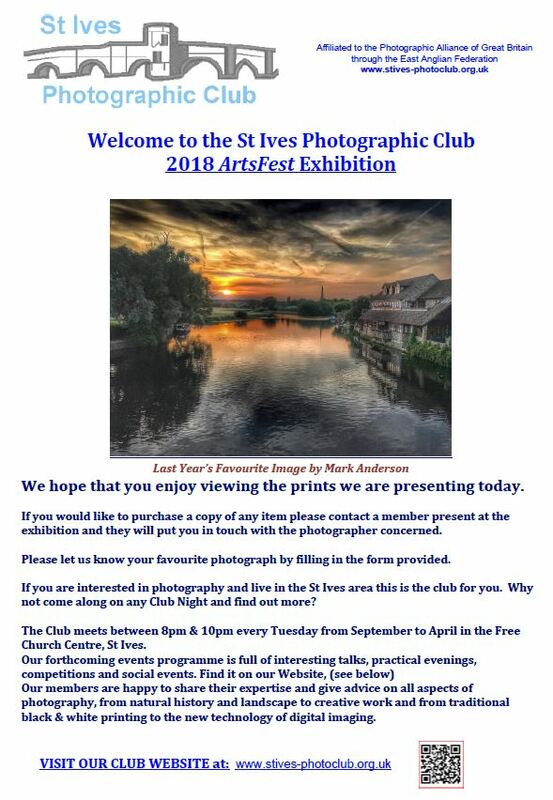 Booking required: If interested in this event, please notify secretary@stives-photoclub.org.uk with your name. Minimum numbers so if insufficient people, the event may be cancelled. Meet afterwards at the Oliver Cromwell pub. Anthony Hans will present a review of Summer Programme. Alice to present her images from her trip to Australia. Followed by a practical session on print mounting by Gary Dean. A talk titled "A Learning Curve" by Justin Minns. Justin says "Over the last few years I have become increasingly absorbed by landscape photography. This presentation aims to pass along some of the things I have learnt during that time, illustrated by plenty of images." Monthly Competition 1 (Sept) with Judge Richard Houghton. A talk on Macro Photography by Alice followed by a practical session on Macro Photography. No Meeting but good opportunity to photograph at the fair. Critique Evening with Barrie & Liz Hatten. A talk by Steve Laws on a USA roadtrip with tips on how he takes and processes his images. This includes some Milky Way images and tips on how to photograph the Milky Way. This is followed by a practical session on getting to know your camera. So please bring your cameras with you. A talk on New Zealand by Stan Mace. Followed by a practical session. A talk titled "From Shoot to Print" by Malcolm Sales. A masterclass on getting the best out of using Adobe Lightroom. As a professional photographer shooting about 100+ images a day Malcolm will demonstrate how he uses this excellent programme to speed up his workflow. Monthly Competition 3 (Nov) with Judge Dave Stewart. 1. Four Seasons – My Photographic Year.” by Anthony Barraclough. This is a collection of images taken at one location over a number of years in season order starting with Winter. 2. Followed by Photoshop by Steve Laws. This will be a follow up to Malcom Sales talk on Lightroom and will cover the following Photoshop techniques: layers and mask; focus stacking; replacing a sky; healing and cloning. Quartet Competition with Judge David Steel.